I’m going to go against today’s push led by Arianna Huffington and the early to bed, “sleep eight hours” army. You must listen to your body in order to establish a better bedtime routine. Some people need 9-10 hours of sleep. Winston Churchill preferred a biphasic sleep where he slept for a few hours each night (usually from 3 am to 8 am) and again in the afternoon for two hours. Thomas Edison saw sleep as a waste of time and practiced a polyphasic sleep schedule sleeping for 30 minutes to an hour every four to five hours. Leonardo Da Vinci did the same. Figure out what makes you feel most rested and commit to that type of sleep schedule. Most sleep gurus will tell you that you need at least one hour before bed that is electronic free. This is because of the blue light stimulating your brain and disturbing sleep. Again, the electronics ban is something that is largely personal. Does checking your emails before bed cause you anxiety or does it allow you to feel more in control of what you’re facing tomorrow morning? Are you a light sleeper who is disturbed if someone sighs next to you or can you sleep with a freight train in your home? It’s important to note, the light from a train is incredibly disturbing, a lot more than a cell phone, although I haven’t seen the studies. But if you’re having issues falling asleep or staying asleep, try instituting the electronics ban an hour before bed and charge those electronics somewhere outside of your bedroom. Instead of using electronics right before bed, do a quiet activity you enjoy. You can read, meditate, work on word puzzles, take a hot bath, snuggle with your kids or a hundred other activities that can help signify to your brain that the day is ending. Some business owners prefer to review their day, congratulating themselves on their wins and putting together a new game plan to conquer their challenges. But don’t let this daily review cause you anxiety. If it does, turn it back to celebrating the good things that happened and enjoy the feeling of being grateful for what you and your team accomplished. By doing the same activity every night, your mind will begin to understand what the activity signals – impending sleep. Psychologists tell you to establish a sleep routine for your child. The consistency and predictability are relaxing. It works that way for adults too. Nothing kills sleep faster than anxiety and reviewing all the things that went wrong in the day or everything you have to do tomorrow. Stop it. Instead, practice mental control. If an anxious thought comes into your head, envision yourself holding it in your hand and then blowing it away like a dandelion seed. Then think about something that brings you great joy and only think about the joy aspect. For instance, your children may bring you joy and you may start thinking about them but then your thoughts quickly erode into how angry they made you today or how you let them down as a parent. If you need to, “transport” you and your children to a happier place, like a family vacation that hasn’t occurred yet. Your happy place doesn’t have to be real. Your focus is on the happiness so whatever brings you that can set your mind at ease enough to gently drift away to sleep. This is another personal suggestion as some people find music very distracting when trying to sleep. But there are sites like Brain.fm (and music sites like Amazon) that play sounds, not traditional music. These “songs” are created by artificial intelligence with the insights of auditory neurologists. They’re designed to induce deep relaxation in about fifteen minutes. The quest for sleep is one that eludes many successful business people, but it’s extremely critical to your abilities to running a successful venture. A lack of sleep can severely impair your problem solving and decision-making capabilities. 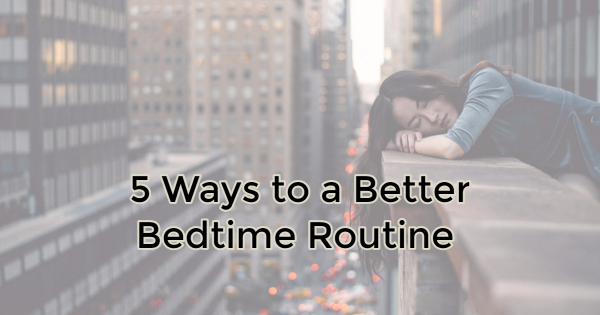 The key to establishing a better bedtime routine is to do what works for you. If eight hours of sleep leaves you feeling groggy, try other sleep schedules until you find one where you feel refreshed. Use sounds or a fixed bedtime routine/activity to signify to your mind that it’s time for rest. Finally, if none of this is working get a professional opinion. You could have a life-threatening condition called sleep apnea or extreme anxiety, which could be contributing to your inability to find sleep and stay asleep. Finding a sleep solution is critical to your success in business. Stop borrowing energy from tomorrow. Create what you need today.